The main target of the present paper is valorize the high alkalis in cement kiln dust for production of sustainable hybrid alkali activated composites, where these high alkalis content prohabit its recycle in building materials. The used precursors are electric arc slag (EAFS) and granulated blast furnace slag (GGBFS) as well as cement kiln dust (CKD) was studied. Activation was carried upon usage of 25% CKD, as it bears high alkali content that can initiate and propagate the polymerization process. The formed geopolymer composites were immersed in 5% MgSO4 solution to determine the stability upon sulfate attack. FTIR, XRD, SEM, compressive strength, and water absorption analysis were utilized to examine the obtained geopolymer under sulfate attack. Results clarified the potentiality of cement kiln dust in production of alkali activated composites with durable properties in sulfate solution and possess an optimization of strength values by EAFS up to 50%, followed by lowering in strength with EAFS increase, although possessing stability up to 12 months. Data elucidated a good stability and resistance of mix containing slag substitution by 50% EAFS and 25% GGBFS and resulted in further enhancement in both mechanical and microstructural characteristics by increasing matrix compaction and cohesion than the non-immersed samples (28 days). Formation of nucleation sites of CSH for geopolymer accumulation and precipitation by alkaline dissolution of aluminosilicate precursor. Geopolymers are alkalis induced inorganic polymers, for aluminosilicate precursors, where the resultant structure constituted of alternating SiO4 and AlO4 tetrahedra chains. Feret  as well as Purdon  studied alkali activation of blast furnace slag, during the 1940s; their trials were to utilize binder activated by NaOH solution. Garcia et al. 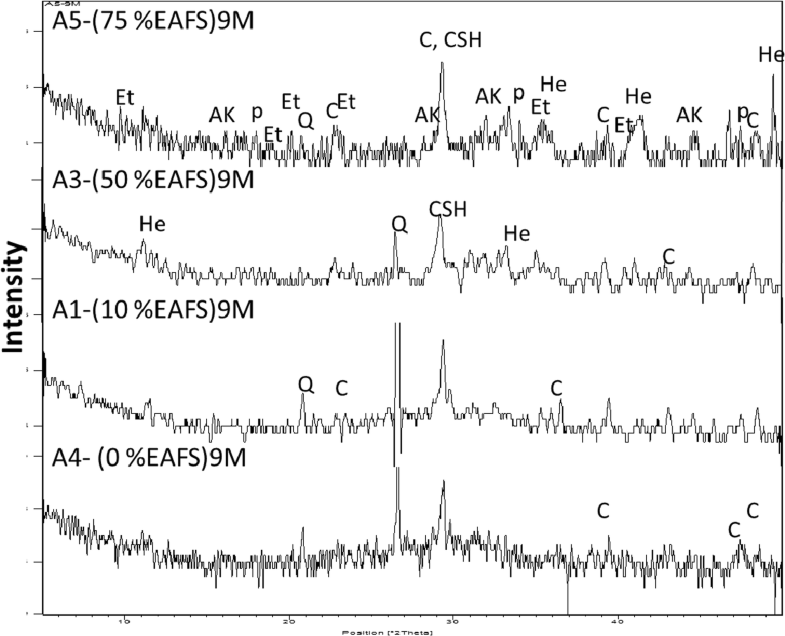 stated that the main binding materials formed in slag activated by alkalis based on C–S–H, whereas Bakharev et al. demonstrated a variation in the structure of CSH formed in activated mix than normal CSH (calcium silicate hydrate) from cement hydration, where N–C–S–H (sodium calcium silicate hydrate) may also be formed. From the engineering scope, the most important consideration in infrastructure applications is the resistance of the formed concrete to aggressive medium and where sulfate attack can be considered as most deteriorating by forming expanding materials that will form internal stress to concrete structure and cracking, where this attack can be externally from environment or internally from the binding materials and aggregates [5, 6]. The reaction between hydrated cement and aggressive sulfate-bearing media leads to expansion, cracking, and degradation of mechanical characteristics where ettringite and gypsum are the main resulting and deteriorating phases that affect formed binding materials . There are many predominant precursors for production of geopolymer binders as fly ash [7, 8, 9], ground granulated blast furnace slag [10, 11, 12], or a combination of both [13, 14, 15], where their resulting products show some enhanced durability-related properties. Morphological and mineralogical characterization has possessed good knowledge for produced structures from alkali activated fly ash/slag blends [14, 16, 17, 18, 19, 20, 21, 22, 23, 24]. Bakharev  also studied the activation of fly ash and reported that the resulting products possess better resistivity to sodium and magnesium sulfate solution than cementing materials. Bakharev et al. 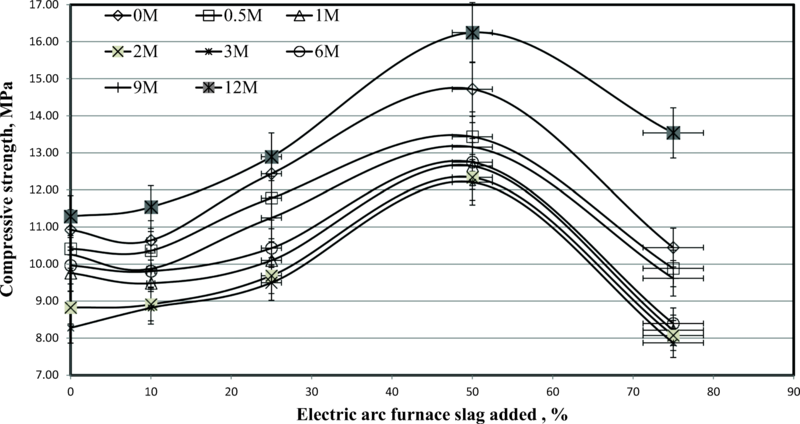 reported the little or no expansion of activated slag by immersion in sulfate solutions; however, little visible cracks were shown, whereas with increasing time of exposure to sodium sulfate media a noticeable increase in strength can be observed. Contrarily to sodium sulfate, magnesium sulfate results in decrease in mechanical properties but still has better resistance than Portland cement . El-Sayed et al. investigated the immersion-activated water-cooled slag in MgSO4, whereas activation was performed using various ratios from activators. Results elucidated better resistivity up on activation by 3:3 wt% sodium hydroxide and sodium silicate, respectively, than using 2 and 6% of sodium hydroxide. Khater  explored the activation of slag materials using cement dust as alkalis bearing material; author also studied the resistivity of the resulted composites to magnesium sulfate solution. Results indicated that the use of 25% cement kiln dust to slag materials possessed high stability against sulfate attack up to 6 months. This was in accordance with Conner . 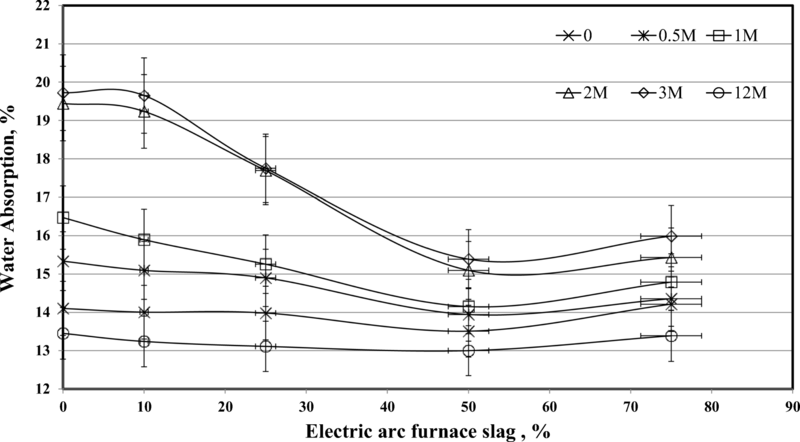 Khater  investigated also the influence of EAFS on geopolymer composites activated by cement kiln dust, where the result illustrates that 50% arc furnace slag possess the optimum ratio for geopolymer composites. Many researchers explored the characterization of EAFS and possible application in construction sector especially as additives for cement [32, 33], its potential expansivity , its reactivity [35, 36], and possible application in concrete [36, 37, 38]. Researches depicted its good mechanical properties as well as high density were the main advantageous properties as its high weight was a key factor, in such constructions for making dense blocks, infrastructures, and others. The main purpose for the present paper is to demonstrate the durability performance upon immersion in 5% MgSO4 up to 1 year, of EAFS along with GGBFS as well as cement kiln dust. Investigation of the hardened composites with immersion time will be carried out using FTIR, XRD, compressive strength, water absorption, and SEM to evaluate geopolymer stability to sulfate attack. Aluminosilicate materials were blast furnace slag (GGBFS) and arc slag (EAFS) and cement kiln by-pass dust (CKD) brought from Egypt, where their compositions are tabulated in Table 1, where GGBFS has a bulk concentration from calcium, aluminum, and silica oxides, while arc slag is reach in ferric oxide; however, cement dust is reach in alkalis oxides as well as calcium oxide. On characterizing the raw materials using XRD as in Fig. 1, one can notice clearly the amorphous structure of blast furnace slag while crystalline structure is the predominant for arc slag, while cement dust illustrates its calcite, halite, and sylvite content. From the previous equation, GGBFS has coefficient of 1.0 while EAFS has 0.96, which can be interpreted by lower oxidative capacity of GGGBFS than EAFS. The hydration modulus of GGBFS was 1.39 while that of EAFS was 5.02; on the other hand, the optimum ratio should be not lower than 1.4 for better hydration characteristics. From the previous data we can conclude the better hydration properties of EAFS as well as latent hydraulic properties of blast furnace slag. Raw materials were mixed with a mixer for 15 min and for further 5 min where their details and mix designs are represented in Table 2. All mixes were cast into cubic molds of length 2.5 cm followed by vibrating for better compaction and then covered with lid to diminish water evaporation. Mixes were left for 24 h at room temperature, followed by curing at temperature of 40 °C and 100% relative humidity for 28 days. Specimens were then immersed in a 5% MgSO4 solution . The solution was replaced monthly up to 1 year, where their strength values were recorded; finally, the crushed cubes were stopped for further hydration using acetone/methyl alcohol method (1:1) [28, 29], finally tightly conserved in container until examination time. Chemical composition was analyzed using Axios X-ray fluorescence, while mineralogical characterization was accomplished by Cu-Kα Philips PW 1050/70 and collected from 0° to 50° 2θ. 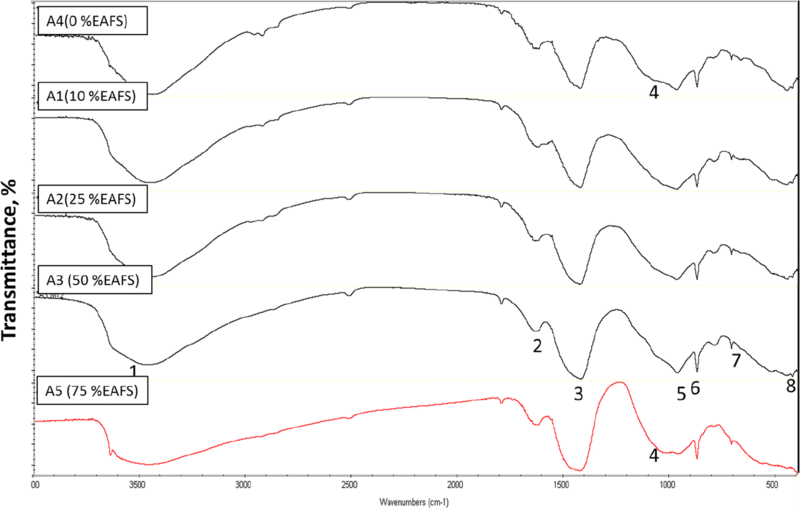 The produced geopolymer composites were also examined by FTIR using KBr binder for preparing the sample while the wave number was ranged from 400 to 4000 cm−1 [43, 44]. The morphology and microstructure of hardened geopolymer composites was examined by SEM equipped with EDX. where w1 is the dry weight (g) at 105 °C and w2 is the water immersed weight for 24 h (gm). Mineralogical pattern of 10% EAFS geopolymer mix immersed sulfate solution up to 12 months is shown in Fig. 2, where there is an amorphous region at 6° to 10° 2θ for aluminosilicate gel with quite small band for amorphous phases in geopolymer at the zone from 17° to 35° 2θ. Those regions are known as the important characterization regions for geopolymer, wherever the growth of these regions will affect performance of the produced composite. There is a decrease in intensity of CSH band up to 3 months, followed by an increased broadness and intensity with time up to 12 months as depicted from the wideness at 29.4°. This was caused by an increased matrix alkalinity due to the hydration progress as well as an increased geopolymerization reaction, where the interaction of free silica with free hydrated calcium oxide in CKD and free dissolved calcium species within the composites forming CSH with time fill and precipitate within an empty pore at later curing ages. A minor calcite increase with hydration rate increase can also be observed as a result of atmospheric carbonation reactions . On studying effect of EAFS from 10 to 75% exposed to 9 months (Fig. 3), a growth in the broadness of CSH peak with arc furnace slag up to 50% (A3) is noticed. This is accompanied by an increased intensity within range of 17–35° (2θ) indicating the increased amorphous geopolymer structure, where the iron cations balance the negative charge of 3D network forming well-organized and arranged geopolymer composite. This will increase the mechanical characteristics and provide more stability under sulfate attack [48, 49]. 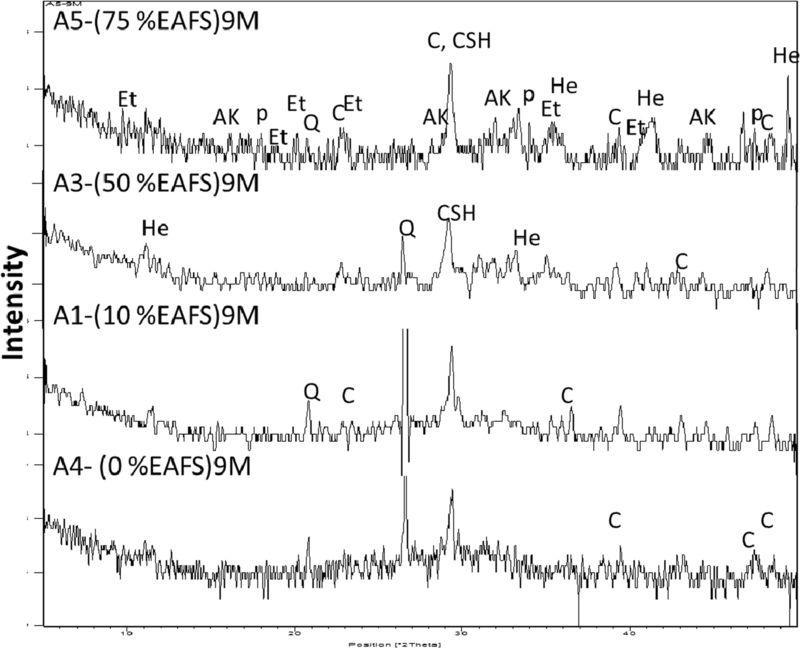 Increasing EAFS to 75% (A5) leads to an increase in the hematite, akermanite, and ettringite content. The resulting geopolymer structure is more susceptible to sulfate attack. As indicated from ettringite formation, also, the increased hematite negatively affect the geopolymerization reaction by consuming hydroxide ions and so reducing the dissolution of the remaining unreacting constituents, which rapidly reprecipitated as hydroxide or oxyhydroxide and so decrease necessity alkaline content for geopolymerization reaction as coincided by explanation recorded by Daux et al. . This can be illustrated clearly from the decrease in the vitreous hump at the abovementioned range. The increased carbonate intensity aligned to cement kiln dust and free unreacted alkali carbonation, in addition to carbonate growth with EAFS increase as identified carbonates in this used precursors which hardly react under alkaline activation conditions . FTIR spectra for mix incorporating 10% EAFS immersed to 12 months (Fig. 4) indicate a decrease in intensity for geopolymer representative band of asymmetric (T–O–Si) at 975 cm−1 [43, 44] till to 3 months as a result of ettringite formation at early ages as represented from asymmetric stretching vibration at about 1110 cm−1 corresponding to S–O4 stretching mode (ν3) and out-of-plane bending mode (ν4) of ettringite [51, 52]. With increasing immersion time up to 12 months, a growth in the broadness of T–O–Si depicted an increased vitreous content as a result of increased alkalinity which retards ettringite formation [53, 54]. Uses of 10% EAFS lead also to an increase in the two hydration bands at about 3400 and 1600 cm−1, where arc furnace slag with high hydration modulus ratio can result in great dissolution in their cationic species and supply soluble calcium ions which result in formation of CSH phases beside the formed geopolymer phases leading to an extra strength of the composite . The carbonate bands at 1430 cm−1(ν C–O) and 867 cm−1(δ C–O)  resulted from the used raw materials as well as carbonation of free unreacted alkalis . 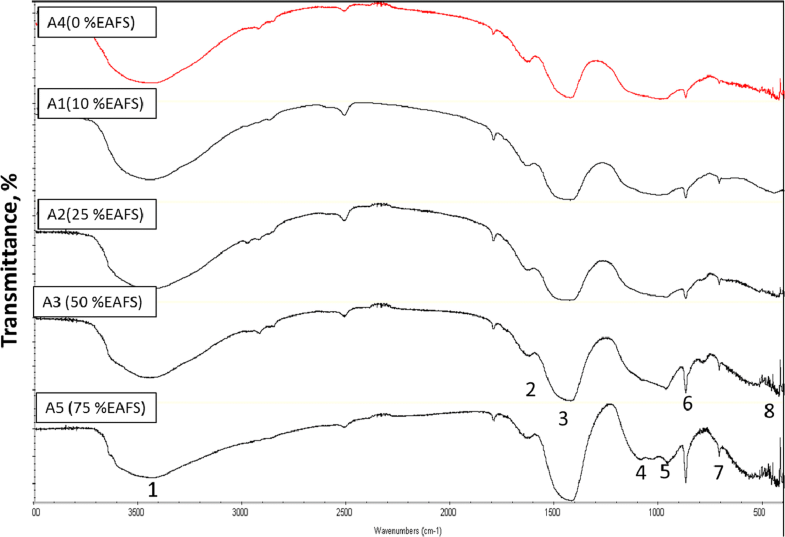 The immersion effect at 6 using various ratios of EAFS as illustrated in FTIR spectra (Fig. 5) illustrates growing in broadness of T–O–Si band at about 975 cm−1 with EAFS up to 50% in addition to shifting to lower wave number indicating the increased vitreous component. The increased intensity of the Si–O–(Si, Al) asymmetric band in addition to the shift to higher wave number (from 690 to 779 cm−1) with increased contents of EAFS up to 50% (A3) proposes alteration in aluminosilicate framework as compared with GGBFS geopolymer composite resulting from cationic replacement in non-framework sites . However, a sharp increase in asymmetric stretching vibration at about 1110 cm−1 corresponds to ettringite [51, 52], upon using 75% EAFS reflecting the decreased content of the amorphous geopolymer resulting from the increased iron content resulting in lower stability against sulfate attack as reflected from ettringite formation. 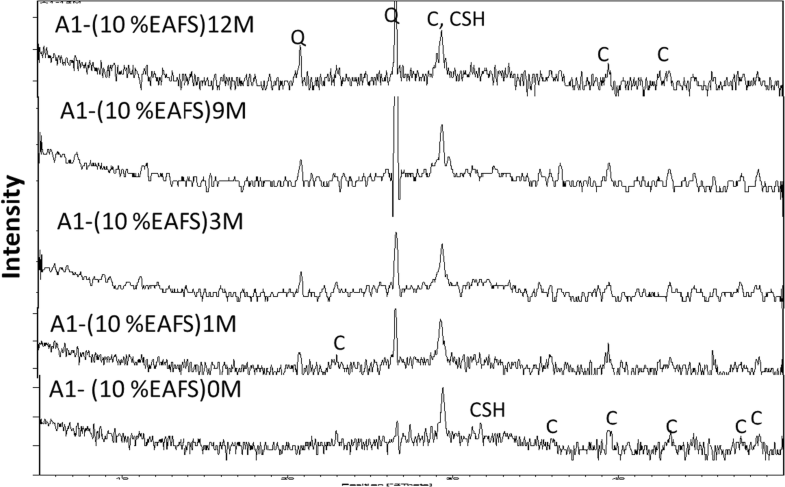 Carbonate bands are almost constant with EAFS as a result of their inactivity under alkaline activation . Further increase in the immersion time (12M) (Fig. 6) led to extra ettringite increase upon using 75% EAFS. 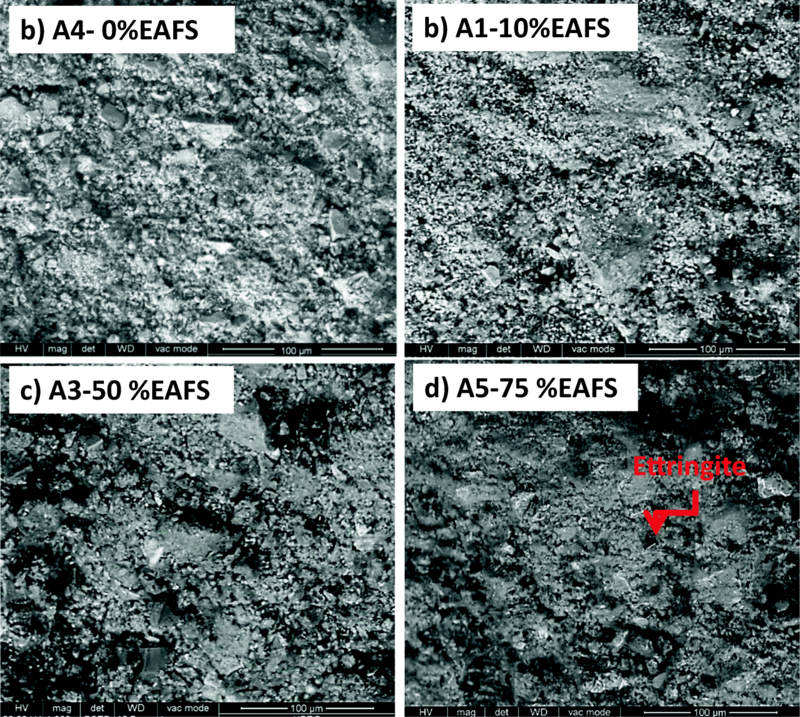 A continuous increase in the main asymmetric band of the amorphous geopolymer is observed up to 50% EAFS as illustrated in Fig. 6, reflecting the stability against sulfate attack upon using 50% EAFS. There is low-intensity band identified at 3648 cm−1 for OH− stretching band of the hydroxyl in brucite , confirming ettringite formation, as magnesium hydroxide results from interaction with free calcium hydroxide (CH) results from hydration of quick lime in cement dust forming gypsum, then ettringite. The scanning electron micrographs of 10% EAFS months immersed geopolymer specimens activated by using 25% CKD as an activator are presented in Fig. 7. The micrograph for un-immersed mix indicates spreading of geopolymer in the matrix with the formation of homogeneous structure (Fig. 7a), while increasing the immersion time to 3 months resulted in the formation of low cohesion within reacting materials while heterogeneity is the main feature for the formed matrix as a result of ettringite formation at early immersion time (Fig. 7b). The formed ettringite participate in hardening as well as solidification of the paste. Upon increasing the immersion time to 6 and 12 months (Fig. 7c, d), a more homogeneous and compact microstructure is observed as a result from development and precipitation of geopolymer chains within pore medium; however, propagation in geopolymerization reaction beyond 3 months related to the destabilization of ettringite upon increasing alkaline content where the increased alkalinity within pore solution hinders ettringite formation [53, 54], whereas the formation and growth of the amorphous geopolymer N-A-S-H gel as well as binding gels (C–(A)–S–H) have a progressive outcome on the microstructural properties forming three-dimensional dense and compact network from geopolymer chains . 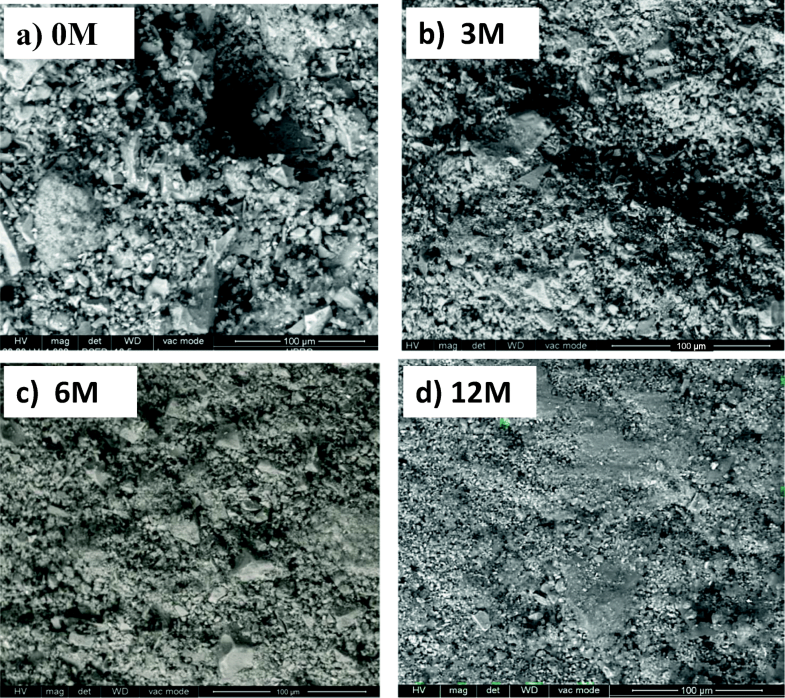 The SEM micrographs of 12-month magnesium sulfate immersed geopolymer specimens having various EAFS ratio are revealed in Fig. 8. Geopolymer specimens free from EAFS (Fig. 8a) present heterogeneity of the matrix dispersed by geopolymer plates as well as calcium silicate hydrate in addition to more voids. Further increase in the EAFS to 10 and 50% (Fig. 8b, c) resulted in the CASH increase which may offer more accumulation sites for geopolymerization process leading to more cohesive matrix , while high iron content with arc slag offered an additional balancing cations for the stabilization of geopolymer network as came clear in Fig. 8c . However, increasing EAFS content to 75% resulted in the increase in the iron content which consumes the alkalis within the matrix and hinder geopolymer formation, and be more prone to sulfate attack as illustrated from the ettringite needles spread all over the matrix (Fig. 8d). Figure 9 depicts geopolymer strength values for immersed specimens up to 12 months in sulfate solution, as it was known physicomechanical properties related to the extent of dissolution of aluminosilicate precursors forming three-dimensional chains. From the figure, one can notice decrease of strength with immersion up to 3 months, formerly the strength increased again up to 12 months. It is known that blast furnace slag grains are soft, whereas arc furnace slag is hard due to the presence of high iron content than GGBFS, so the combination of both can lead to the formation of compact and dense structure. 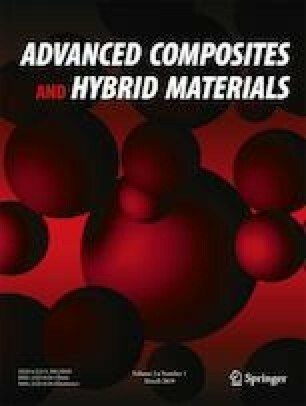 Based on the current work 50% EAFS beside GGBFS leads to the formation of composite with highest compressive strength as the anhydrous part of the EAFS contribute strongly to strength as well as high capability of Ca2+, Fe3+ to act as balancing charge cations for aluminosilicate network . The results exhibit increased strength values with EAFS up to 50% followed by lowering in their values with further increase; however, they possess stability up to 12 months with higher values than zero EAFS mix by 6.53%, 14.72%, 47.44%, and − 4.89% after immersing time of 3 months and 2.26, 14.26, 43.97, and 19.98% after immersing time of 12 months for replacement by 10, 25, 50, and 75% of EAFS, respectively, which means slight stability of compressive strength at latter ages as reflected on lower enhancement ratio for latter ages than for early ages. The last values reflecting the stability of geopolymer mix contain 50% arc slag than other mixes. Upon increasing immersion time, the destabilization of ettringite upon increasing alkaline content as a result of increasing vitreous geopolymer content by increased geopolymerization reaction is known by its high pH, while the increased alkali content in pore solution retards ettringite formation, so the strength increases up to 12 months. 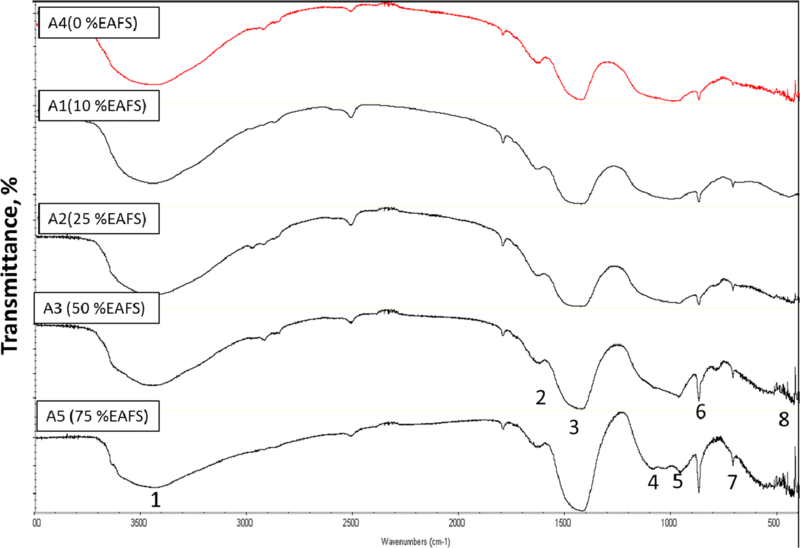 The behavior of the strength pattern is in accordance with the XRD and FTIR interpretation and emphasized clearly from the scanning micrographs. Table 2 demonstrates oxide ratios for the studied geopolymer mixes where increasing EAFS results in modification and optimization of the oxide ratios up to 50%, which possess higher values of total M2O/Al2O3, total M2O/SiO2, and SiO2/Al2O3 equal to 0.80, 0.12, and 4.20, respectively; this can be connected to strength gain with EAFS up to 50%, whereas the ideal molar oxide ratios are 0.2 < M2O/SiO2 < 0.48 and 3.3 < SiO2/Al2O3 < 4.5 , which can efficiently form branched network and forming homogeneous and compact structure formed. Using 75% EAFS gave total M2O/Al2O3, total M2O/SiO2, and SiO2/Al2O3 equal to 2.08, 0.20, and 6.54, respectively, where increasing oxide ratios results in formation of linear poly-sialate disilioxy structure rather than 3-D network formed by previous EAFS ratio, beside the negative effect of the high iron as identified by Daux et al. , where dissolved iron content during geopolymerization reaction results in reprecipitation as hydroxide or oxyhydroxide phases more rapidly than the reprecipitation of Si and Al which consumed the necessary alkalis for geopolymerization reaction. The results of absorption for geopolymer specimens (Fig. 10) have the reverse trend of the compressive strength profile, where it decreased with EAFS up to 50% followed by increased values with time up to 3 months, as the formed ettringite at early ages increases water-absorption capacity as well as porosity resulting from the increased internal stress. However, the absorption decreased sharply with a prolonged immersion to 12 months, where the porosity decreased at this age as indicated from the SEM (Fig. 9) which favors the increased alkali concentration and so the geopolymerization degree. The research work focused succeed in exploiting high alkalis as well as free lime within cement kiln dust for the activation of industrial slag wastes for production of environmentally friendly materials. Electric arc furnace addition possessed high sulfate resistance up to 50%. All mixes possess stability up to 12 months with higher mechanical properties than neat mix. Increasing EAFS to 75% (A5) resulted in an increase in the hematite and ettringite content which made the resulting geopolymer structure more prone to sulfate attack. Water absorption decreased up to 50% EAFS, while increased with immersion time up to 3 months, then decreased sharply with prolonged immersion up to 12 months.